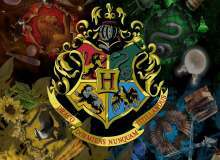 Do you want to find out what Hogwarts House you are in? I'm in Hufflepuff. You can be in Gryffindor like Harry Potter, Ravenclaw like Luna Lovegood, Slytherin like Draco Malfoy, or Hufflepuff like Cedric Diggory (or me). Which is your favorite color out of the following? Which is your favorite charactor out of the following? You find someone getting bullied what do you do? Which do you think fits your personality the best? There is new drinks at the Leaky Cauldron. Which one will you choose? Are you excided for your answer? JUST GIVE ME MY ANSWER ALREADY!!!!!!! What's your favorite animal out of the following? Quiz topic: Which Hogwarts House am I In?